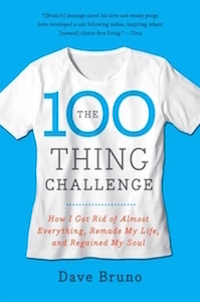 Dave Bruno is the author of 100 Thing Challenge. Dave Bruno was concerned about consumerism and decided to embark on a personal challenge to live for 12 months owning only 100 things. Define ‘Personal’ things – are they things he owned solely or shared? As a parent and partner the line blurs here. Memorabilia – What counts in terms of special trinkets, trophies and reminders? Books – Is each book a single item or is a collection of books equal to one library? Some things are groups – He counted socks, jocks and undershirts as one group. It wouldn’t have been practical otherwise. Household items – There were some household items that were shared. Gifts – He gave himself 7 days to keep or not any gifts he received. New Things – He could still buy new things as long as he stayed at or below 100 things in total. Despite having the same name as Sebastian Terry’s manifesto 100 Things, the intent here is very different. And, whereas Sebastian’s list of 100 Things is a List Manifesto of things he wanted to do, Dave Bruno’s manifesto is a set of rules for how he wanted to play his game of limiting his life to 100 things or possessions. It’s a great contrast between a list and a rules based manifesto. On the one hand Sebastian Terry has a list of end results and on the other Dave Bruno has a set of rules for getting to an end result. One is a focus on outcome, the other on process. Which do you prefer? We reviewed Dave Bruno’s book 100 Things here.